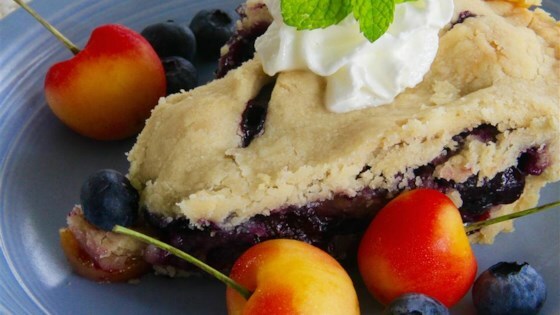 "A very yummy pie, made with fresh blueberries and fresh cherries." Mix sugar, flour, and cinnamon in large bowl. Add fruit. Add lemon juice, and stir well. Pour into a 9 inch unbaked pie shell. Dot with the butter or margarine. Cover with top crust and flute edges. Cut small slits in the top. Bake at 375 degrees F (190 degrees C) for 1 hour. I put a baking sheet under mine to catch any liquid that might bubble over. I made this pie with canned cherries & frozen blueberries I had on hand & it was still delicious. I only added 3/4cup of sugar to compensate for the sweeter fruit. I enjoyed the blueberry/cherry/cinnamon combination, but I found the pie to be a little too sweet. This was a great pie. I love blueberries and cherries and this was a great combination!